When we left the hut before dawn, Christophe, the guardian’s parting shot was ‘be careful to read the topo very carefully beyond the Trident. This is where a lot of people get lost.’ Christophe hadn’t done the route, so we took this encouragement fairly lightly and romped off up the moraine in the dark. We were heading to a little frequented route on the south face of the Grand Drus – the south pillar or ‘Voie Bastien-Contamine.’ Two years ago I had been up here to do the same route with a couple of French friends, but we had to rappel out after only a few pitches as I developed symptoms of altitude sickness despite the modest elevation. 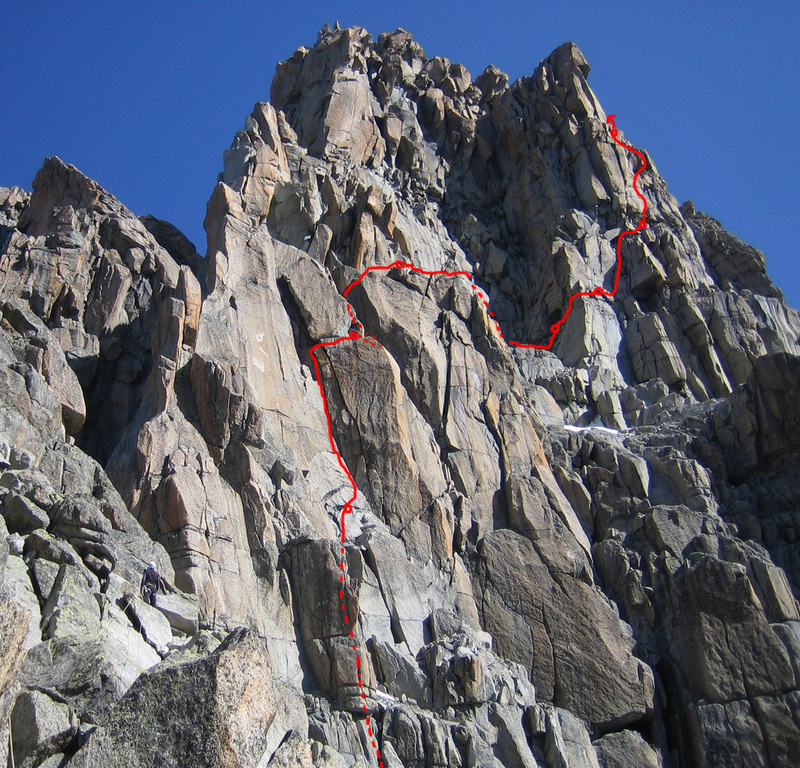 I had also been up that year to try a route on the north face, the ‘guides route’, but been rebuffed by the impassable seracs late in the dry summer at the base of the route. 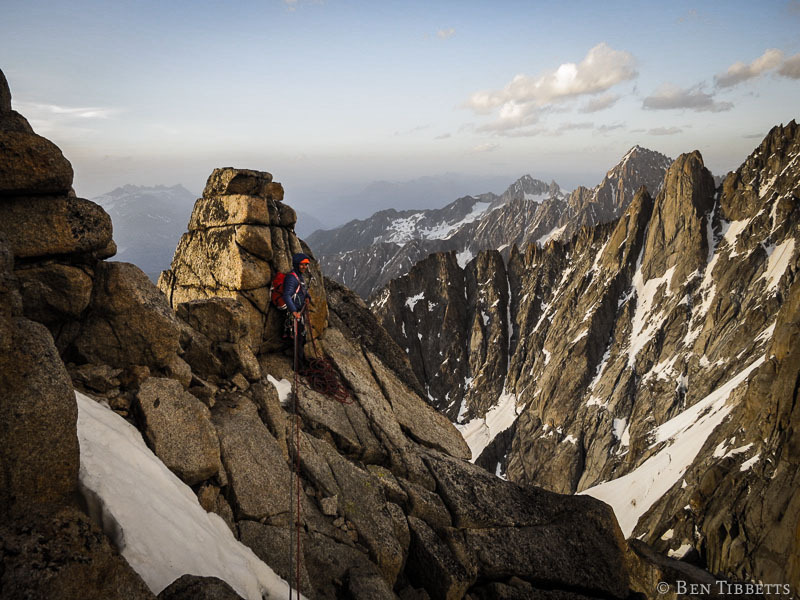 This summer I had been hoping to get a chance to do the Walker spur on the Jorasses before heading back to Wales to train for a rock assessment, but with storms throughout much of July only one party had succeeded in arduous mixed conditions that weren’t very appealing. Plan B was to finally climb on the Drus. 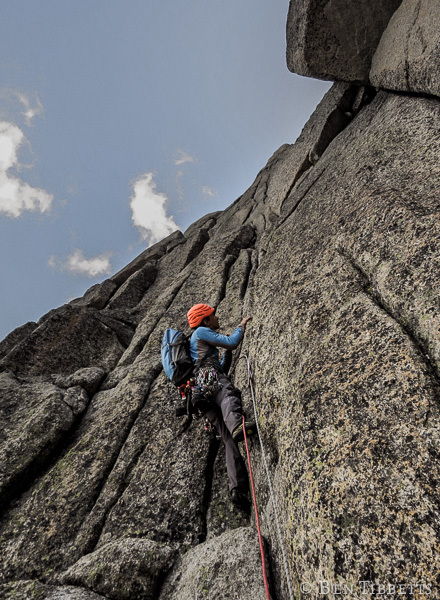 Despite none of the routes being much longer than 800m, most outside of the classic traverse do not receive much traffic and consequently do not have the pegs and worn rock that can help route-finding on more popular outings. 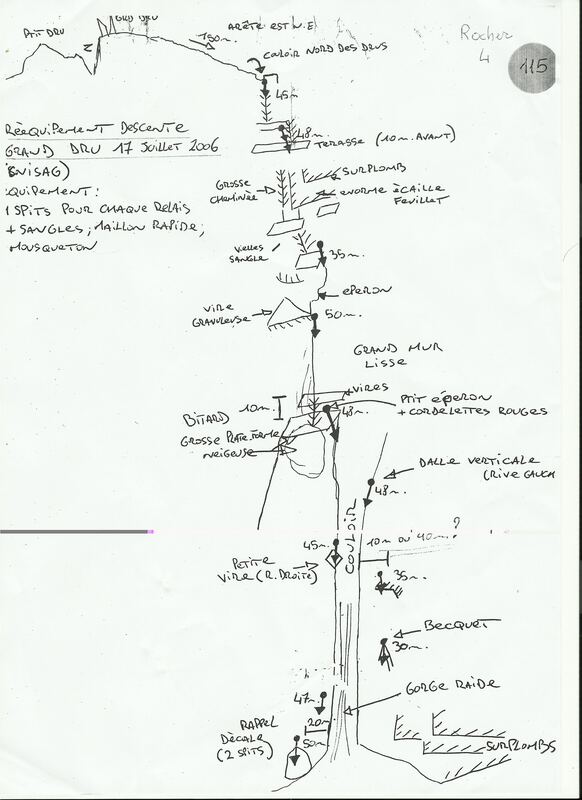 The descent is also engaging enough to have a topo drawn up for it, despite having been equipped with one bolt at each anchor in 2006. I wasn’t expecting a particularly epic outing, but rather a fun route and some great rock climbing in the sun. The weather forecast was for the hottest day of the year so far – 34°C at 1000m, yet becoming very windy as the foehn developed later in the day. Not a problem, as we planned to be off the mountain by the afternoon. 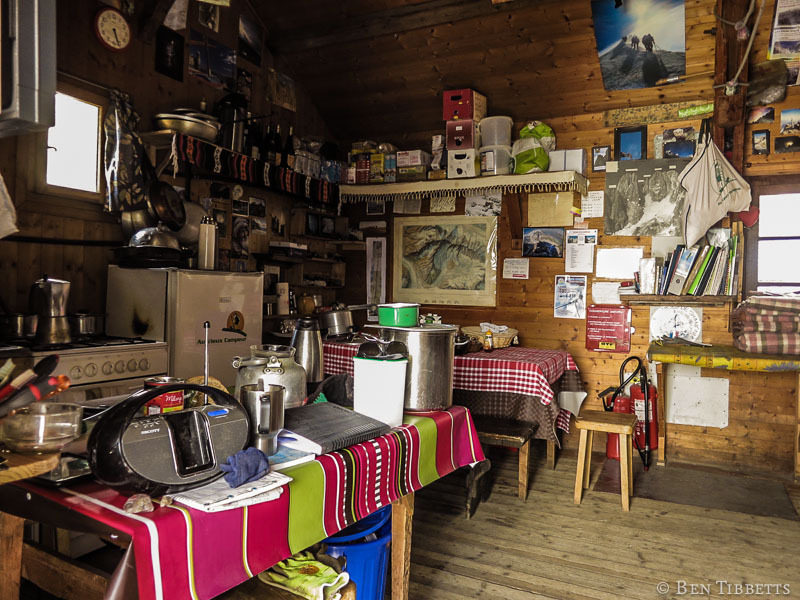 It was great to be back at the eagle’s nest of the Chapoua hut again. As Christophe said ‘everything we do here is not like the other huts’! It can be cramped when full (12 places), but with just a few guests it is a great retreat from the swarming tourists. 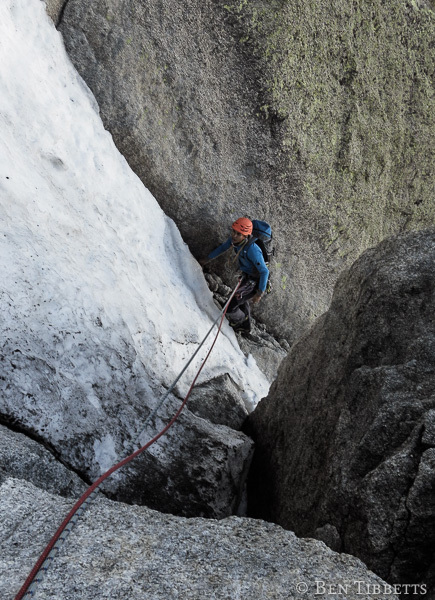 The access to the base of the Drus can be a little complicated due to an often unpleasant glacier crossing, but after a good winter of snow it was still fairly amenable and we got to the route about 6am. We then spent a while checking we were in the right place. It looked like where I had started the previous time had been the wrong place! 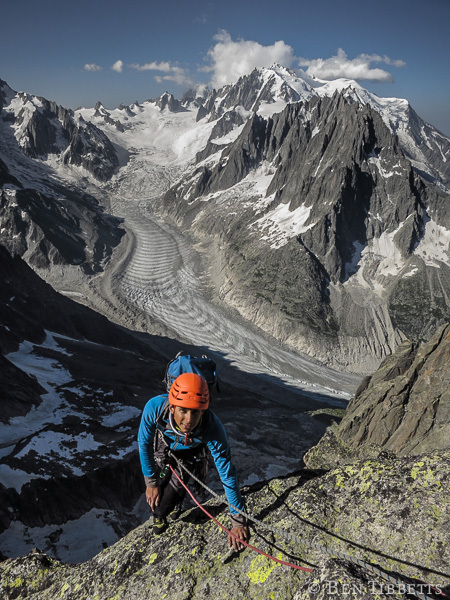 The first few pitches are delightful climbing, but early in the morning with a pack of crampons, axe and a day’s water, they felt a bit of a burly wake up. My technique was ragged to start off, and my hand quickly succumbed to the abuse. These were classic smooth granite cracks – udging, jamming, bridging and smearing upwards past the odd ancient piton and wooden chock. 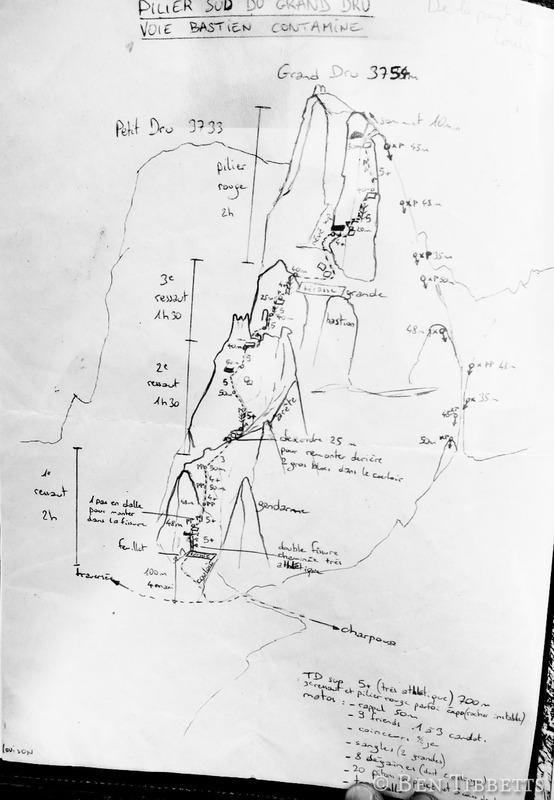 The route is not described with a detailed topo diagram in any guidebook, but a young local Chamonix guide has made a good drawing. This suggested two hours for the first quarter of the route, which seemed reasonable if not conservative. 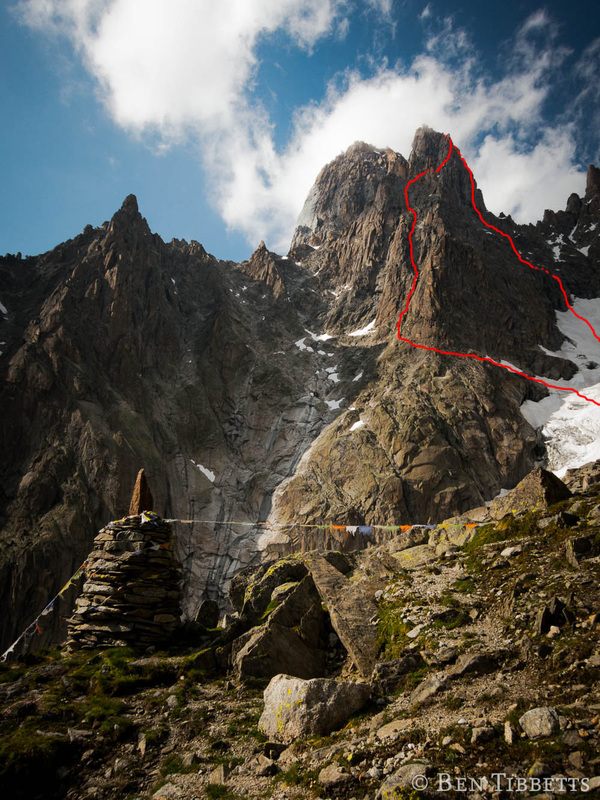 However, with more time spent looking up and around route-finding than actually climbing, we soon used up the hours. We still arrived in slightly the wrong place on a ridge overlooking a gulley that we had to traverse to start the second tower. Ideally the gulley would be free of snow and we would down-climb a steep ramp into it, pass a couple of large blocks and climb out. There was unfortunately, though not unexpectedly, quite a lot of névé still obscuring the passage. We rappelled into the gulley and I hacked my way back out the other side with an alloy axe, chopping steps in the icy sections for my rock boots! Foolishly I neglected to put on gloves so got hot aches on the hottest day of the year. I then had to belay in the shady gulley whilst Misha led on out into the freshly sun-warmed rock. 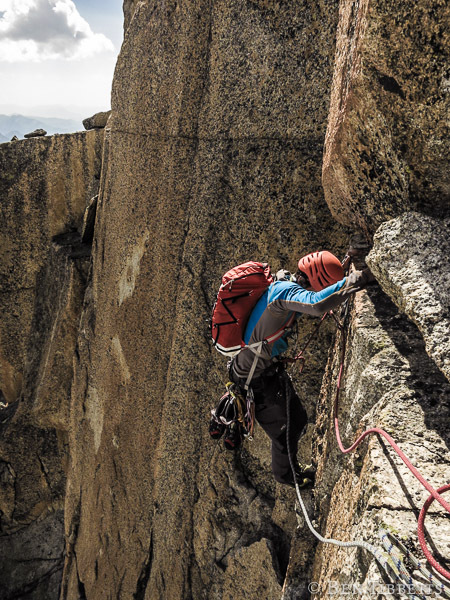 Ever conscious that we were slipping behind the desired pace, I tried to lead on swiftly up the runnels and slabs above. Never entirely sure where I was but trying to follow the logic I thought the first ascensionists might have had. This wasn’t a major route, or even a hard route, but the consequences of difficult routefinding and then getting lost were beginning to look inevitable: a very windy night on the side of the mountain with few clothes and no food or water. 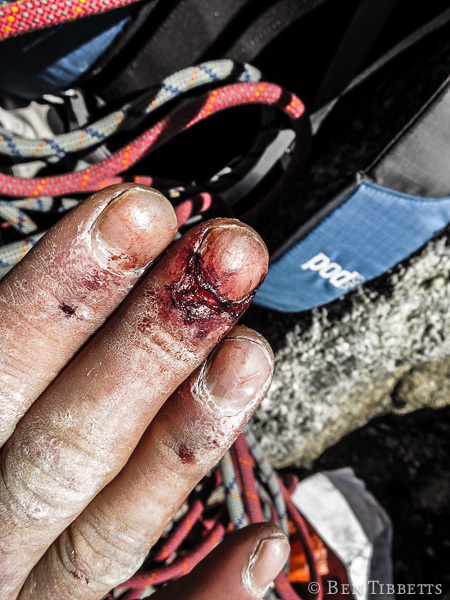 The mind urged the body up a series of corners, cracks and wobbly flakes to a terrible belay below and an imposing open corner. It didn’t look remotely like it was ‘the way’, but it might be a way, I thought. Or at least I had to think so, as I liked any of the other options even less. The corner started pleasantly enough, if vigorously, but took my only 2 large camming devices. So I made a moves and leapfrogged my gear up the crack until presented with two options whose outcomes I couldn’t see, but neither of which seemed that good. It is an unusual sensation to be so utterly lost that essentially one is new routing. It varies in my experience from rather exciting, to scary and unpleasant depending on rock quality, state of mind and other factors, like the deteriorating weather. This is the stress and the pleasure of an adventure, of an uncertain outcome… the type of fun that is more likely to seem fun in retrospect. It is largely a matter of context. Had we been looking to quest up untraveled or unrecorded terrain we would have been in a different mental space, better prepared. I took the curious and blind escape out right, hand-traversing, and found a ledge with another mediocre belay. Another pitch up a corner and another escaping crack out right, and I found we had got right to the series of broken ledges we were aiming for. Significantly relieved, but significantly late, we pressed on across the last patch of snow and round onto the last pillar. Several pitches and some surprisingly steep wet rock later, we exited onto the summit ledges at 8.30pm and headed straight for the cairn on the ENE ridge. This marked, we hoped, the beginning of the descent line. The light was fading fast, but we started down with strong gusty winds tugging our ropes away and round every catchy spike of rock. 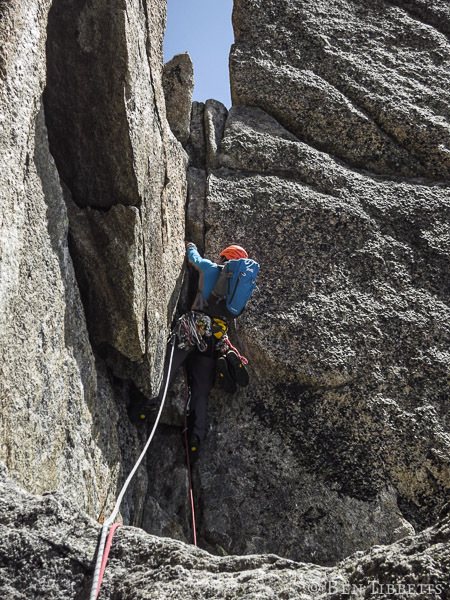 Each rappel anchor is well thought out to ensure it is sheltered from rock fall from above, and that the ropes pull down over clean rock with minimum likelihood of catching in a crack. Consequently this means they are also well hidden from the descending climber – bouncing around left and right, hunting around ledges and blocks. The descent topo is thankfully very accurate, and with a good headlamp beam and close attention to rope lengths, we found each anchor point. 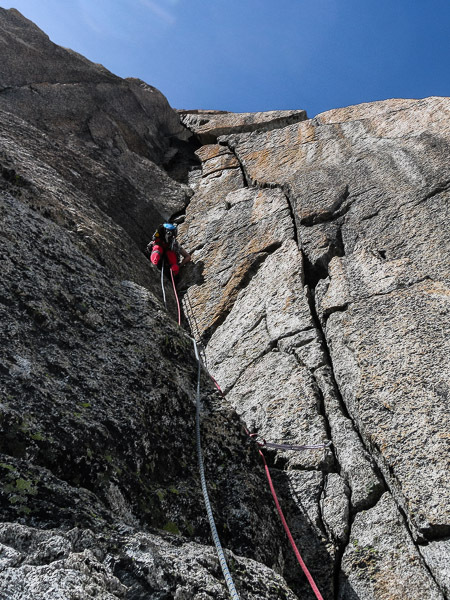 There were several religious moments as the rope threatened to snag, but we progressed slowly downwards, gradually more sheltered from the wind, gradually wetter as we rappelled down either side of a moist gulley from the Col des Drus. Eventually we found the last crucial bolt anchor, far off to the right as we descended and just above the rock prow that overhangs the rimaye. 55m further and this dropped us over the rimaye and onto the glacier below. All this while, Misha had been following me down the ropes as the batteries had all but died in his torch. As I strapped my crampons onto my approach shoes, Misha elected to break trail and left me with his torch, now emitting barely enough light to see my feet. When we swapped torches again lower down, Misha found his i-Phone to be better at illuminating the ground! We slept well into the next morning and awoke to gorgeous fresh coffee. The guardian was jovial and bemused that we had taken so long but made it down nevertheless! 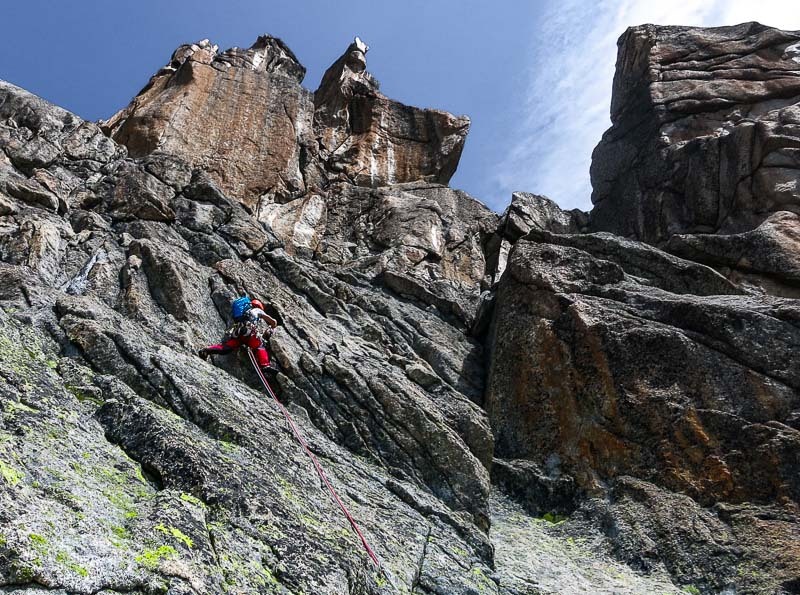 Though the third pillar lets it down, due to lack of line and some mediocre rock at the base, it is a great route overall. The line we took was somewhat in excess of the nominal grade, but with a good range of protection (.3-3 Camalots + full set nuts) one is never risking a long fall. I would recommend it if you are looking for an adventure a bit off the beaten track! 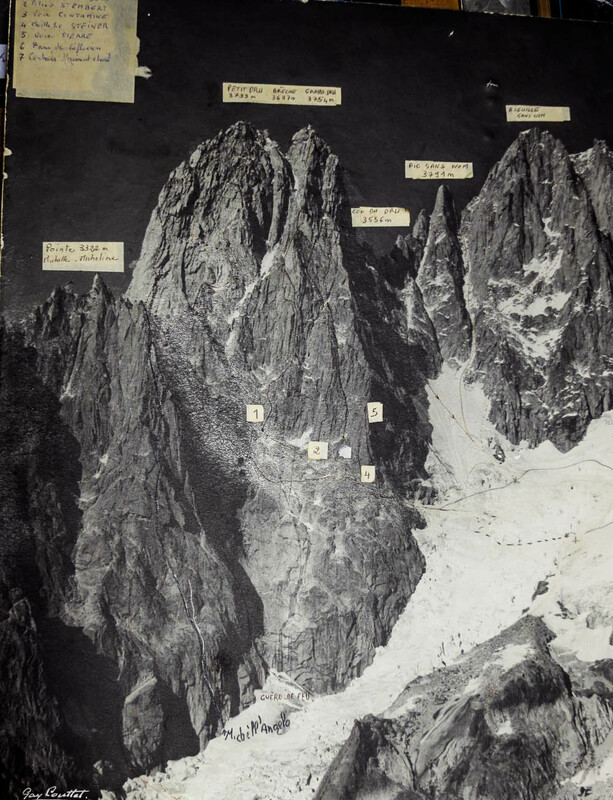 The rock is largely high quality, and there are a number of memorable pitches. 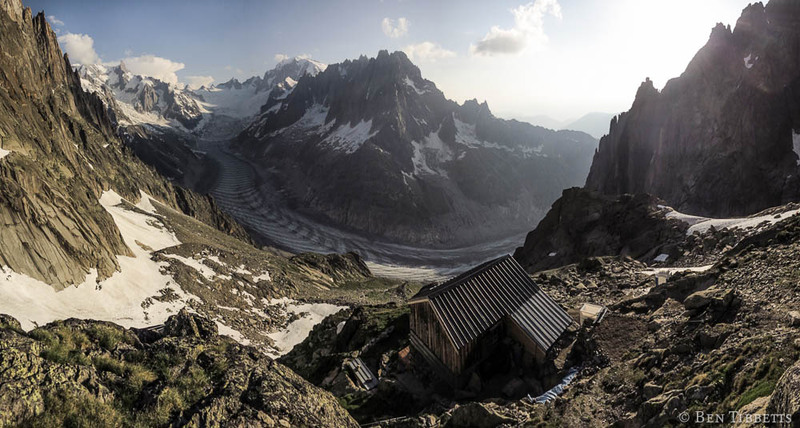 You might, if you get back to the hut before nightfall, even enjoy a cool beer at sunset and be able to look smugly down over at the semi-bolted pleasure climbing arena of the Envers des Aiguilles, reminiscing about how times are not like they used to be! Back down at home in Chamonix, and I made haste packing to move to Wales the next day for two months… the rat has been well fed. seems you both had a great adventure on this day – congratulations!